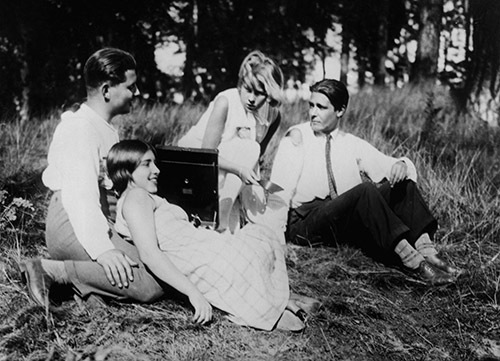 Back in February we welcomed the globally celebrated band Múm to play a live score to the silent film masterpiece „Menschen am Sonntag“ in the city of its creation on the shores of the Spree River. After two sold-out nights in the mighty hall of Radialsystem V we are very happy and proud to present another round of splendid music meeting a milestone of cinema in the frame of Copenhagen’s great film festival CPH PIX. On 28 October, Múm’s founding members Gunnar Örn Tynes and Örvar Smárason join forces with percussion wizard Samuli Kosminen to perform an improvised live score to the often overlooked German classic within Dagmar Teatret’s charming interior. Copenhagen, here we come! CPH PIX is an annual film festival in Copenhagen. It resulted from the merger of the Copenhagen International Film Festival and the NatFilm Festival in 2008 to create an organisation called Copenhagen Film Festivals, which also manages the documentary film festival CPH:DOX and the BUSTER Film Festival for children and youth. The first CPH PIX Film Festival was held in April 2009 with an audience of 36,500 people, which was the largest audience ever recorded for a film festival in Copenhagen. Since the first edition, the festival has grown to have an audience of more than 55,000. This year the festival also celebrates alternative film music: Besides Múm, it presents artists like Elevatorfører, Berlin-based experimental trio B/B/S, Swedish sound artist BJ Nilsen and the Canadian film artist Karl Lemieux in cinematic live shows all around Copenhagen. An event of CPH PIX, presented in collaboration with UM:LAUT, Gong Tomorrow, Wilhelm Hansen Fonden & Goethe Institute. Get yourself prepared for Denovali’s next visit to the capital! Once again we team up with the great label from Essen, which has made its mark in the last ten years with unique and ambitious releases. On the heels of the successful cooperation of the last two years, we invite you to experience a special two-day festival with finest experimental and electronic music at Radialsystem V. On 13 & 14 June we will present renowned international artists such as Forest Swords, Nils Petter Molvaer and Moritz von Oswald, our favourite Denovali acts plus young and upcoming musicians from all around Europe and beyond. Tickets available now at Radialsystem V, Koka36 and online! 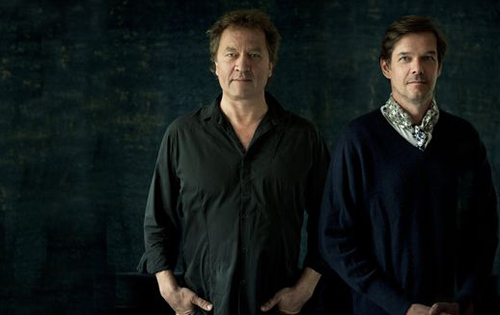 The first evening of the festival sees a fusion of a special sort: The Norwegian trumpet player and renowned jazz producer Nils Petter Molvaer encounters the techno and dub legend Moritz von Oswald. Meandering between cineastic-spherical and minimalist moments, the musical symbiosis of two individualists and visionary artists creates unique soundscapes. „Somewhere between jazz, ambient, avantgarde, and club: fantastically unconventional music…“ (Die Zeit). After its celebrated first visit to the stage of UM:LAUT in 2013, Hidden Orchestra from Edinburgh returns to Berlin: Band leader Joe Acheson and drummer Jamie Graham present their live remix set at RADIALSYSTEM V. The Brazilian composer, percussionist and electronic producer Ricardo Donoso can be experienced live for the first time in Berlin in the frame of the Denovali Festival: His mystical and gloomy sound sculptures are inspired by both contemporary composition as well as drone, techno and noise. Poppy Ackroyd, classically trained pianist and violinist, has already collaborated with musicians and artists from various fields. The delicately woven rhythms and atmospherical melodies of her two solo albums have – apart from some field recordings – completely come into being through Ackroyd’s exceptionally curious and unconventional playing of the piano and violin. 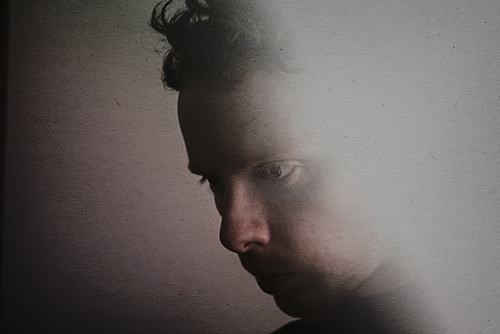 Music which combines heavy dub rhythms, rolling hip hop beats, field recordings and ghostly R&B vocals in a very facinating and original way: Every good musical „best of“ list in 2013 included the epic debut album „Engravings“ by Forest Swords. On the second evening of Denovali Festival Berlin, the Liverpudlian plays his only German concert during this summer. The Czech clarinetist, producer and multimedia artist Floex brings together influences from nu-jazz, electronica and contemporary classical music – his albums and soundtracks have been awarded with numerous prices, and his installations can be experienced at renowned festival like Ars Electronica. Joined by a second clarinetist, vocals and drums, Floex brings his dense, partly complex, partly groovy sound to the stage of UM:LAUT for the first time. Ah! Kosmos is the alias of the Istanbul-based electronic music producer and musician Başak Günak who presented her debut EP „Flesh“ at acclaimed festivals world-wide. In April, Denovali Records releases her first self-produced album „Bastards“ which she presents for the first time in Berlin with the guitarist Övünc Dan and the visual artist Gizem Aksu. With his monicker Witxes, the French Maxime Vavasseur creates his multilayered sound experiments somewhere between ambient, dark jazz, drone and minimal. In a live set, he combines his electronic and acoustic instruments and skillfully alternates between improvisation and passionate sound studies. UM:LAUT goes south and teams up with Jetztmusik Festival to join forces in the experimental field of music and beyond. On 29 March we hit the road and bring along a unique collective of Berlin-based musicians to Mannheim. We are happy and proud to present another night of improvisation with Efterklang’s Casper Clausen, multi-instrumentralist Greg Haines, drummer Francesco Donadello, and percussion wizard Tatu Rönkkö as our very special guests! The project around Casper Clausen of the successful Danish indie band Efterklang, the British multi-instrumentralist Greg Haines, and the drummer and producer Francesco Donadello, considers itself an open forum for creative processes and spontaneous musical exchange. For each concert, further musicians are being invited, with renowned artists such as Peter Broderick, André de Ridder, Dustin O’Halloran, Andrea Belfi, Anne Müller, or Jóhann Jóhannsson being regular guests of the ensemble. This time the band will be joined by Tatu Rönkkö, Finland’s finest in improvisational percussion. Without predetermination and defined boundaries, the shows of The Group bring together new ideas, different impulses and stylistic diversity – the musicians respond to each other, with each other, to the space, and to the audience. With every sound and every piece being created anew, the project gives an intimate insight into the spontaneous interaction and the collective composition process. Making use of their wide range of electronic and acoustic instruments, The Group create an extraordinary and intense live experience: improvised chamber pop between ambient, electronica, dub, experimental and krautrock. We are very happy to invite The Group to the stage of UM:LAUT and welcome a unique collective of international musicians at Radialsystem on 13 December. 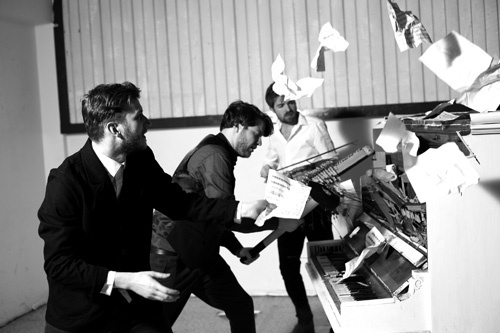 The project around Casper Clausen of the successful Danish indie band Efterklang, the British multi-instrumentralist Greg Haines, the drummer and producer Francesco Donadello, and the guitarist Martyn Heyne considers itself an open forum for creative processes and spontaneous musical exchange. For each concert, further musicians are being invited, with renowned artists such as Peter Broderick, André de Ridder, Dustin O’Halloran, Andrea Belfi, Anne Müller, or Jóhann Jóhannsson being regular guests of the ensemble. Without predetermination and defined boundaries, the shows of The Group bring together new ideas, different impulses and stylistic diversity – the musicians respond to each other, with each other, to the space, and to the audience. With every sound and every piece being created anew, the project gives an intimate insight into the spontaneous interaction and the collective composition process. Making use of their wide range of electronic and acoustic instruments, The Group create an extraordinary and intense live experience: improvised chamber pop between ambient, electronica, dub, experimental and krautrock. We are pleased to announce some very special guests for The Group’s show on 13 December and to welcome Mads Brauer of Efterklang, Italian composer Andrea Belfi, our old friend Anne Müller, the great violinist Ayumi Paul and the brilliant viola player Shasta Ellenbogen on stage at Radialsystem! Stay tuned for more to come – and make sure to not miss this special evening. We hope to see you! 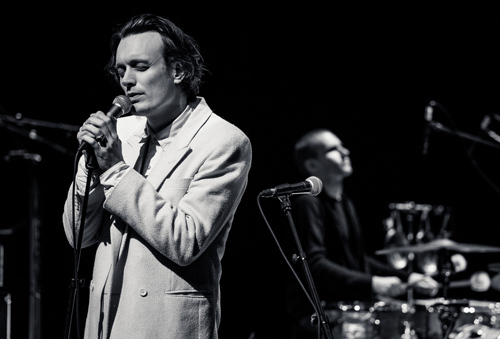 Casper Clausen is a founding member and the singer of the Danish band Efterklang, with which he has been on tour world-wide for more than ten years and released four studio albums until now (4AD, The Leaf Label). 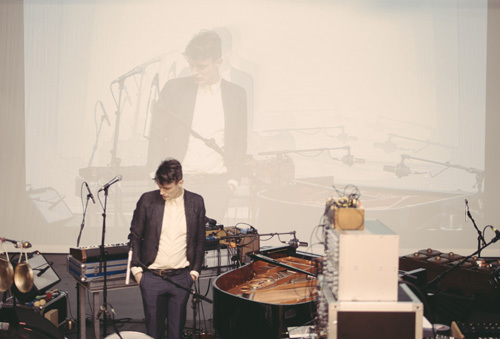 Together with Efterklang, he has been involved in concert projects with symphony orchestras and various film productions. Beyond, Casper Clausen is founding member and curator of the online radio The Lake. 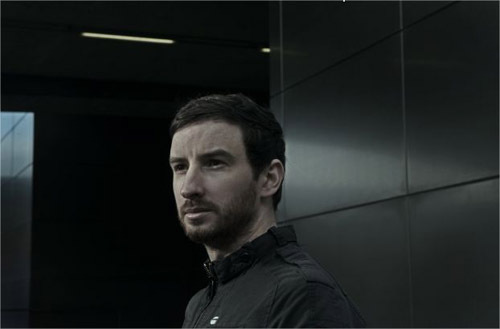 The British composer and producer Greg Haines has already released four solo albums on Denovali Records. 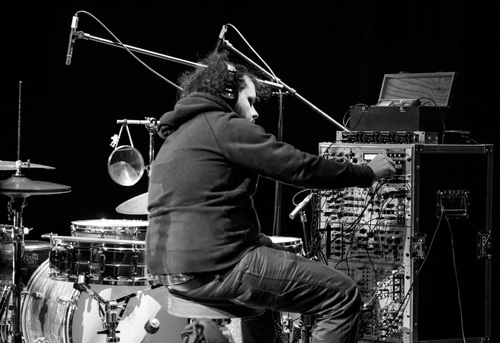 On his acclaimed album „Where We Were“, released in 2013, he moved away from his classically inspired chamber music and devoted himself to analogue synthesizers, percussions and atmospheric soundscapes. Besides his releases and solo concerts, he is involved in collaborations with numerous other musicians and artists such as the choreographer David Dawson, the Dutch National Ballett, the Royal Opera House, Peter Broderick, and The Alvaret Ensemble. The Italian drummer and producer Francesco Donadello regularly works with renowned musicians from various genres such as Modeselektor, Thom Yorke, A Winged Victory for the Sullen, Chilly Gonzales, Jóhann Jóhannsonn, or Mouse on Mars. 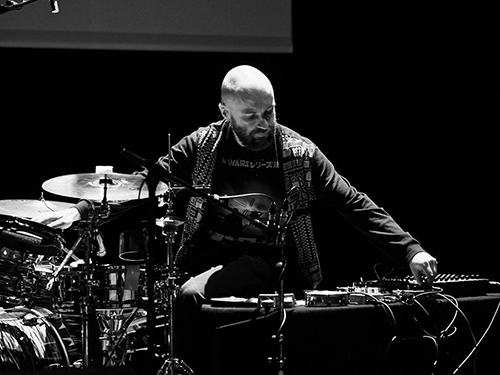 As drummer, he was a member of the Italian post- and indie rock band Giardini di Mirò; for the last few years, he has become more and more interested in experimental music and modular synthesizers. 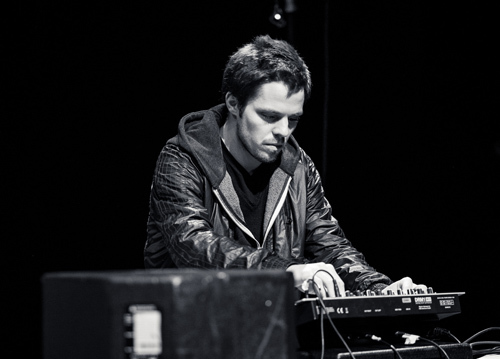 The guitarist and producer Martyn Heyne is a founding member of Trygghet and the Levenmuster Collective, with which he developed the album „Two View“ as well as the DVD „Sensing City“. 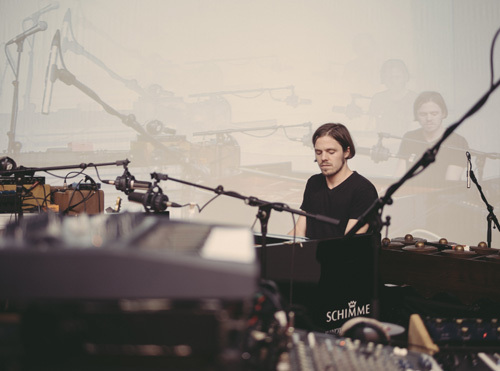 During the last few years, he has worked with the likes of Nils Frahm, The National, Orcas, Peter Broderick, and many more for recordings, concerts and at his Lichte Studio in Berlin. 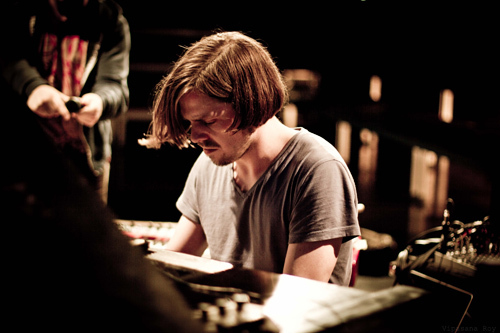 In 2011, he supported Nils Frahm with his solo show; recently, he was on tour with the Danish band Efterklang. Melodies, beats and the desire to surprise… We are happy and proud to welcome three outstanding and renowned artists for another special UM:LAUT event exploring the hybrid sphere between electronica and acoustic music! With jazz pianist Bugge Wesseltoft, producer and composer Henrik Schwarz and the bassist Dan Berglund, three musicians, who are each considered masters of innovative improvisation in their individual fields, join forces in our series at Radialsystem on 2 November. With openness and curiosity the three of them create an electro-acoustic musical blend between jazz, funk, ambient and groovy house music. The Norwegian Bugge Wesseltoft, a pioneer in electronic jazz, and Dan Berglund, bassist for the legendary Esbjörn Svensson Trio, assume the lead for the melody while the electronica mastermind Henrik Schwarz captures the ideas and phrases, manipulating and alienating the sounds, providing the other two musicians with new impulses. It is the search for intersections and the spaces in between, the interaction in the experimental spectrum from classic to electronic instrumentation, between composition and improvisation, club and concert hall. 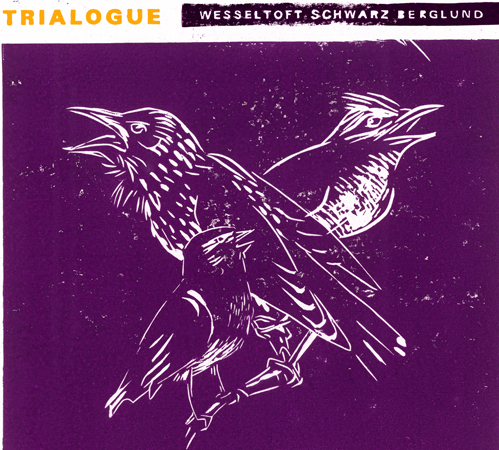 In the series of UM:LAUT, the trio can be heard live for the first time in Berlin – their album „Trialogue“ will be released in September by Universal Music. We are looking forward and want to invite you to enjoy a unique live experience at the mighty hall of Radialsystem on 2 November! Tickets available now at Radialsystem, Koka36 or online! 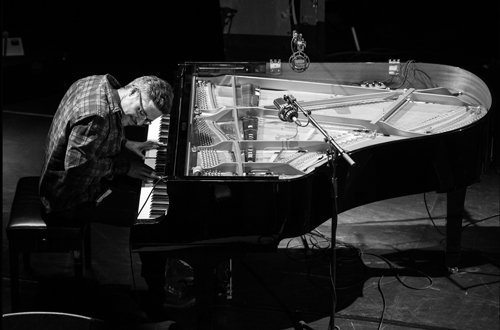 The Norwegian Bugge Wesseltoft is considered the trailblazer of the young Nordic jazz generation and one of the most innovative jazz pianists of today. 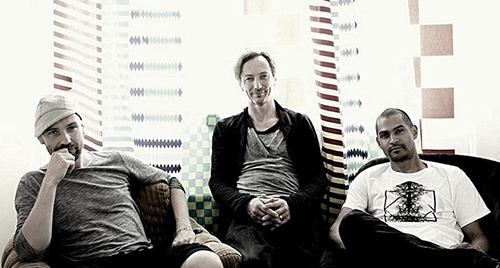 Since the 90’s, Wesseltoft has worked together with numerous stars from the Nordic and international jazz scene, such as Jan Garbarek, Terje Rypdal, Jon Christensen, and Arild Andersen but also with artists with completely different musical stylings such as the drummer Billy Cobham, the Brasilian popstar Gilberto Gil or techno legend Laurent Garnier. With his „New Conception of Jazz“ he aspires to create a synthesis out of live electronica and elements of improvised jazz – his 1996 eponymous debut album, in which he integrates elements of deep house, ambient music, drum’n’bass, soul and funk into his mix, is still considered today as groundbreaking. With his label Jazzland he has created a platform for the Norwegian scene, which enables artistic freedom outside mainstream. Henrik Schwarz is amongst the most sought-after producers of electronic dance music worldwide. His musical influences span from deep house and Detroit techno, all the way to hip hop and rare groove to jazz, soul and funk. 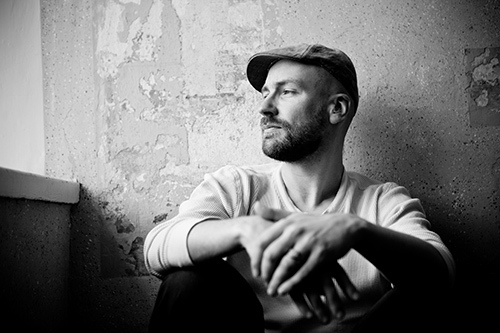 Schwarz is considered one of the most multifaceted artists of the electronic scene – he has composed for film and ballet, and has released numerous albums and singles under various labels. For collaborations, productions and remixes he has worked together with the likes of Michael Jackson, Boy George, The Foals, Ane Brun, Raoul Midon, DJ Hell, Fritz Kalkbrenner and many more. For various projects he has been a guest on stages, in clubs and at renowned festivals all over the world. The Swedish-born Dan Berglund is known worldwide as the bassist for the highly successful Esbjörn Svensson Trio (e.s.t.). 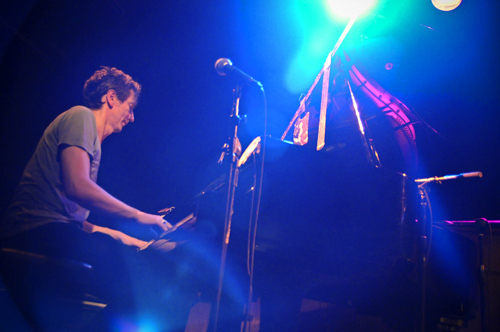 Up until 2008, together with e.s.t., one of the most influential jazz bands of the last decade, he recorded numerous albums and performed in international tours and festivals. Apart from the characteristic warmth and the round and full tones of his playing, Berglund’s trademark consists of his use of countless effects. With his own band, Tonbruket founded in 2009, he created a distinct sound between jazz, psychedelic rock and neo-folk. The group’s debut album won a Swedish Grammy award. After the successful first collaboration in the last year, Denovali and UM:LAUT once again team up to present renowned acts as well as young and upcoming representatives of experimental music at Radialsystem in April. Far beyond musical mainstream, the independent label Denovali has made its mark in the last couple of years with unique and ambitious releases of numerous artists. Rather than publishing music easily assignable to prevalent genre classifications, the work of the label focuses on artists crossing musical boundaries in fields such as experimental, ambient, dark jazz, electronica, jazz as far as new and classical music. With a similarly diversified approach, Denovali has curated and organised the „Swingfest – Experimental Music Festival“ in Essen, which has become famous all over Europe since its premiere in 2007. 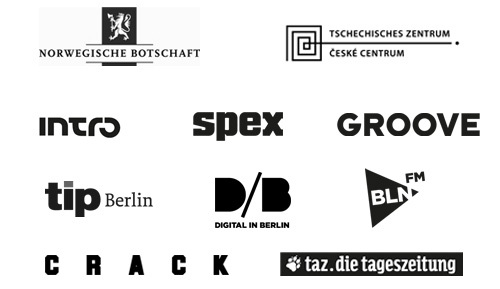 This year, the festival comes to Berlin and London already for the second time. We are happy to work together with the great people of Denovali again and present two days with numerous artists of the label’s roster as well as further international acts, thereby covering a wide range of experimental music. With Murcof, one of the pioneers of the avantgarde scene in Mexico can be experienced live on the first night – with his minimalist ambient which fuses drones, techno and classical music, he is considered „one of the most renowned producers of abstract electronic music“ (Spex). 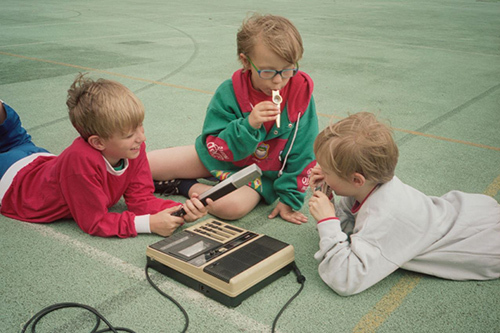 The British composer and producer Greg Haines presents his acclaimed album „Where We Were“, on which he departs from his classically inspired chamber music and experiments with analogue synthesizers, percussions and atmospherical soundscapes. 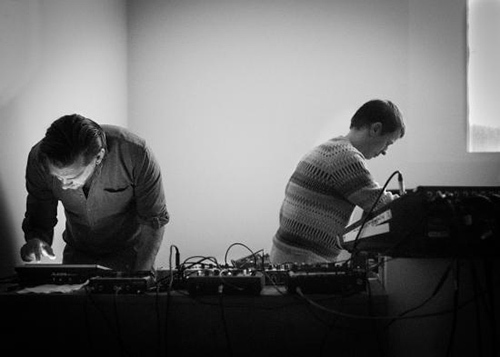 Having recently released their second album, Piano Interrupted, who celebrated their Germany debut on the stage of UM:LAUT in December 2012, explore the range between classical minimalism and clubby electronica with computer and piano. 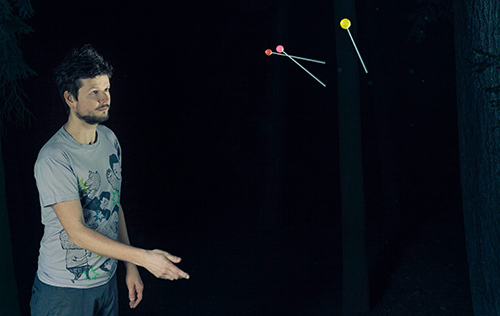 With Origamibiro, the audiovisual trio project around the musician and composer Tom Hill can be experienced live for the first time in Germany. 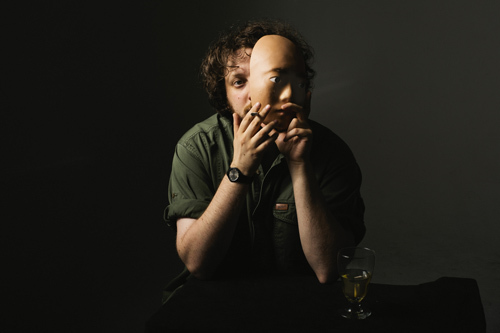 On the second night, Oneohtrix Point Never, an artist who released one of the most remarkable experimental electronic albums of the preceding year on the legendary label Warp with „R Plus Seven“, can be experienced live on stage. The American, whose sound installations were exhibited at New York’s MoMA and who recently created the music to Sofia Coppola’s film „The Bling Ring“, has become one of the stars of the international IDM scene with his abstract, unconventional and innovative sound. 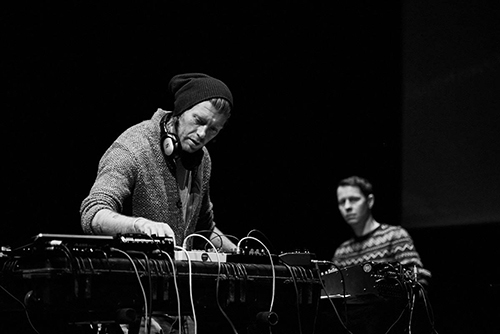 As hardly another formation, Brandt Brauer Frick stand for the fusion of danceable electronica and hand-made music. 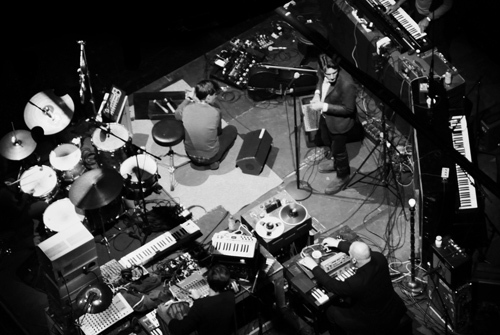 For their multilayered sound between techno and jazz, the Berliners do not only work with synthesizers and samplers but also with classical instruments like piano, violin, cello, trombone, tuba, and harp – the performances with their ten-person ensemble have been celebrated worldwide. At Swingfest Berlin, Brandt Brauer Frick return to their original core as trio with live drums and their deep, minimalist grooves. Ten years after their debut on the label Ninja Tune, the Polish nu jazz duo Skalpel presents one of their rare live sets at Radialsystem. With Sankt Otten, we are happy to announce another exciting Denovali act joining the line-up – we are looking forward to the duo’s atmospheric music with influences from ambient to trip hop to the 70s Berlin School sound. Beyond this, the programme of the second night comprises Talvihorros‚ atmospherical soundscapes betweeen ambient and noise as well as the cinematic compositions of the Glasgow-based sound designer John Lemke.